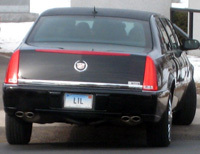 These plates are used on limousines and for-hire cars (but not taxis). Livery plates were issued from 1910 to 1915. They were the reverse colors of passenger plates with an 'L' suffix. 1916 was skipped because they used 'Commercial' vehicle plates. From 1917 to 1920 they used 'Public Service' plates, with a 'PS'- prefix. In 1921 'Public Service' became 'Omnibus', with an 'O' prefix. Livery returned in 1932 and has been in use since. In the late 1980s, the format changed from all-numeric to one having an 'L' prefix and suffix - similar to Interstate (Z) and Taxi (T) plates. The present configuration is L1234L, although lower numbers appear in L1L, L12L, and L123L formats. In March, 2016, a 7-digit format was introduced presumably starting at L00001L . Click the image above to see this type in use. Thanks to Doug for unearthing this one. This plate was issued for use on a 1911 Studebaker in Lakeville. This was issued to a 1917 Ford Model T out of Staffordville.